After consecutive visits to Craters of the Moon, Grand Teton and Yellowstone, we still weren't sick of the national park scene, so Spencer and I decided to venture north to Glacier National Park in Montana. When we arrived in mid-June, we were surprised to find out that some of the roads weren't open until the end of the month. Although this threw a wrench into some of our plans, we appreciated the emptiness of the park and our campground, which was mostly unoccupied. It's rare to find a solitary moment in any tourist destination, even in places made famous for their wilderness. In Glacier, we had the opportunity to pretend what it would be like to be among the first to lay eyes on these impressive mountains, valleys and lakes. Established as America's 10th national park in 1910, Glacier wasn't easily accessible until completion of the Great Northern Railway in 1891. I pictured what it was like centuries before then, when tribes would trek across the mountains in search of bison roaming the plains. Glacier isn't just known for its natural beauty, the park is also famous for some of its architecture. One of our favorites was Lake McDonald Lodge, a Swiss-chalet style hotel with stunning views of the glaciers jutting out of the lake. Just outside the park is a delightful general store and bakery, Polebridge Mercantile, which has served the community in some form for more than 100 years. 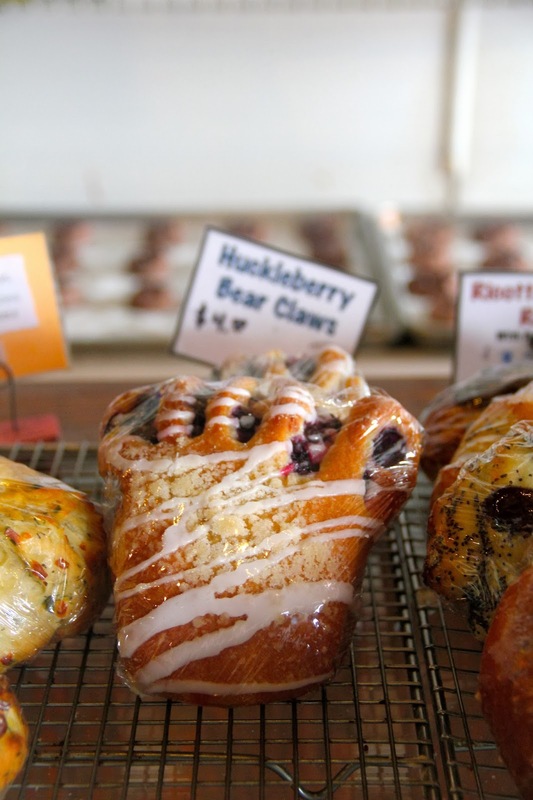 Hands down, it has the best bear claws you will ever eat. I sample a lot of pastries, so I should know. Since we were so close to Canada, Spencer and I took a scenic motorcycle ride across the border to see the Canadian side of the park, known as the Waterton Lakes National Park. The littlest border crossing that could. 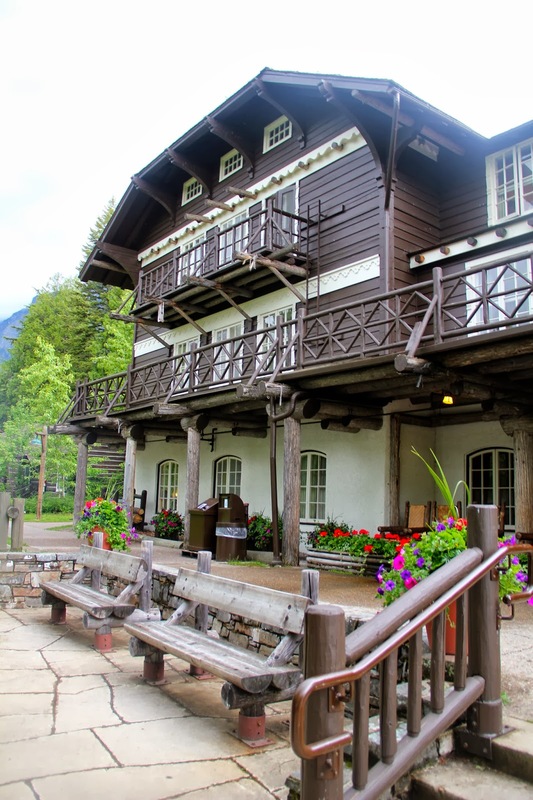 Inside the park, we stopped for lunch at one of Waterton's famous landmarks, the Prince of Wales Hotel. Built in 1926-27, the hotel looks like an enormous alpine ski chalet, overlooking the water with glaciers that dwarf it like a dollhouse. I'll have a side of lunch with this view. As you can see, the Canadian side of the park is equally as beautiful as its American counterpart. Riding across the border on the motorcycle reminded us how big this world is (especially when you're sandwiched between two mountains) and how many more places we have to explore. On to the next stop! With the government shutdown affecting thousands of travelers' vacation plans to see our great national parks, I can't help but feel incredibly lucky to have witnessed the beauty of Yellowstone National Park. Although the brazen tourists who photograph bison from less than two feet away are burdensome and annoying (the camera does zoom), as well as those who capture the entire geyser eruption of Old Faithful with their iPads (often it's the same person), Yellowstone certainly does not deserve the "overrated" label that some travelers bestow upon it. You could set your watch to Old Faithful's eruption. It's no coincidence that around 3.5 million people visit the park each year. (Yellowstone isn't the nation's most visited park, though. Can you guess what is? Find out here.) 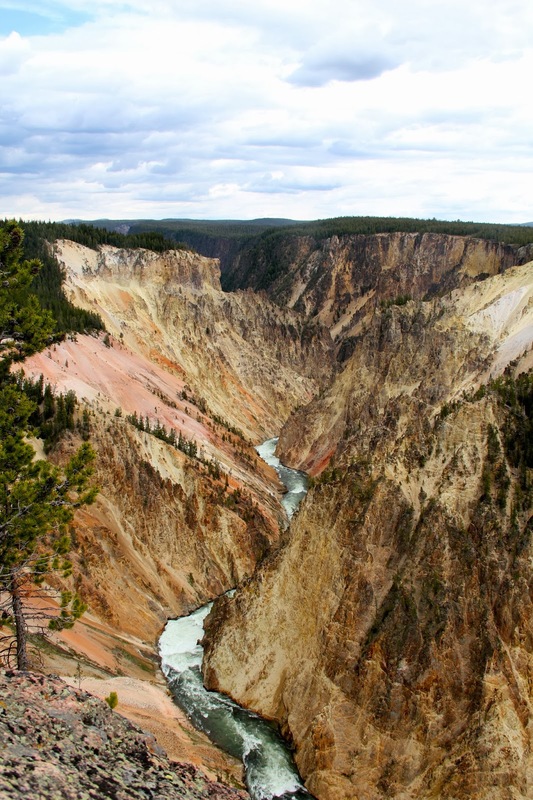 Centuries before President Ulysses Grant commissioned Yellowstone into America's first national park in 1872, Native Americans spoke of its wonder. Yellowstone in one word: Marvelous. 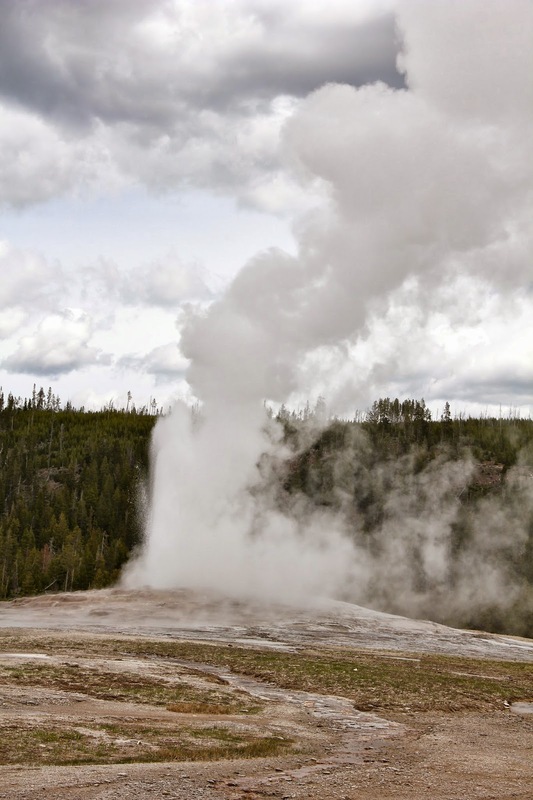 With its unique ecosystems, volcanic activity, and geothermal features, Yellowstone doesn't seem to belong to this planet, let alone spanning Wyoming, Montana and Idaho. These travertine terraces look like an elaborate pool design. 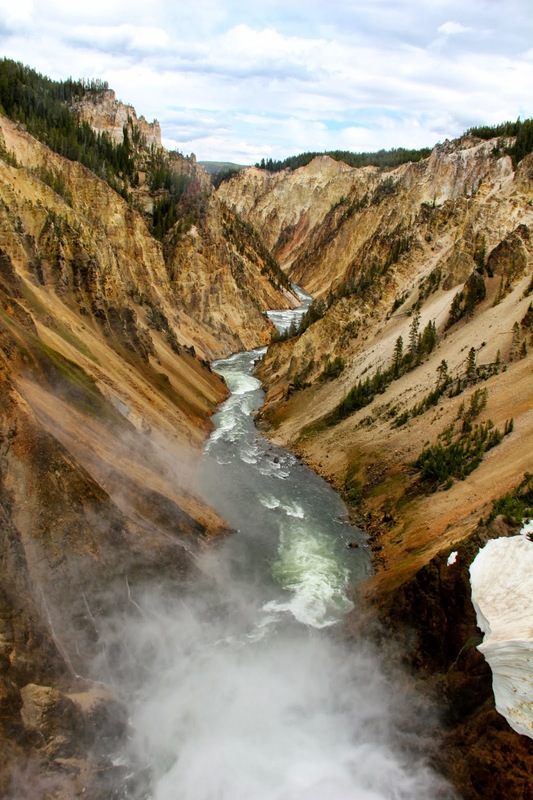 Even if you're not a believer in the supernatural or the divine, Yellowstone is likely to move something inside you. If not, you are cold, hard and made of tin. Please watch Forrest Gump until you develop a soul or until the Wizard of Oz gives you a heart, whichever comes first. We quickly realized that we were without cell service, Internet and even electricity from the quiet hours of 8 p.m. to 8 a.m. For two retirees enjoying life off the grid, that would have been simply amazing. For us, two people funding their journey with "normal" day jobs, that was a problem. We remedied the problem by visiting West Yellowstone, the tourist town just outside the park's gates to do our work. This gave us the chance to focus on the majesty of Yellowstone when we were there. Not to mention, there are few backdrops that make QuickBooks and loan management more beautiful than the valleys, streams, forests and canyons in this park when we worked offline. Staying inside Yellowstone was a huge plus when we found bison meandering over to our campsite in the morning to pay us a friendly greeting. Just like its friendly neighbor to the south, Grand Teton National Park, Yellowstone is also teeming of wildlife. This mama bear climbed a tree with her cinnamon cubs to hide from the growing crowd. 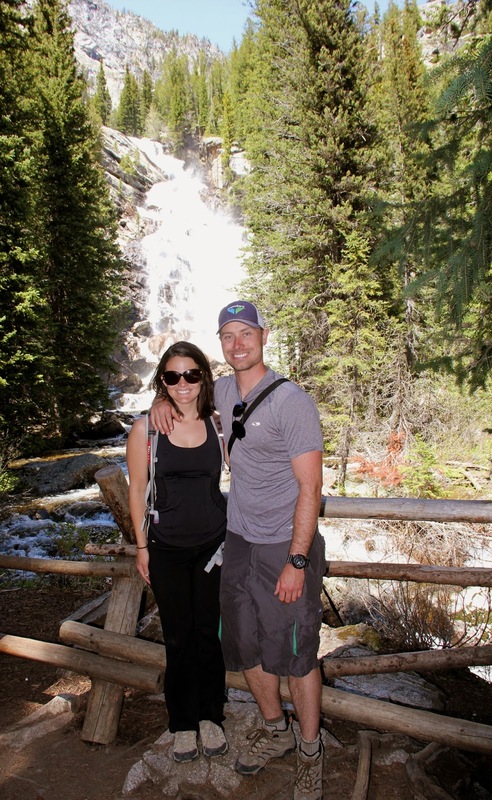 During our visit, Spencer and I learned so much about all of Yellowstone's interesting features, from bubbling basins to prismatic pools to unexpected geysers that leave you soaked. All of the science was fascinating, but sometimes the colorless facts take away the impressiveness of it all. So we took a few moments to step back, look and marvel. There really is so much beauty in this world. Have you ever traveled somewhere incredible, downloaded the pictures on your computer and realized that the photos couldn't do it justice? Grand Teton National Park was the most majestic, breathtaking and lively place we have visited on our journey. Even though our photos are stunning, they still fail to capture the park's true beauty or the diversity of its wildlife. Being adventurous RVers, we decided (read: the GPS decided) to take Teton Pass, a mountain road with a 10 percent grade that reaches heights more than 8,000 feet, to enter the park. The pass is not intended for acrophobics, nor those lacking working brakes, but somehow Spencer and I made it in this big rig of ours. Not without a little help from our favorite backstreet driver, Ellie. Approaching the park from Jackson, we were amazed at the roaming bison munching on seemingly endless acres of grassy terrain. The giant, gentle beasts were unfazed by our intrusion. After settling into our RV site at the park's campground, we were ecstatic to see stunning views of Colter Bay in our mobile backyard. Our first order of business was to capture and shoot wildlife -- with a camera. Despite our beliefs in the Second Amendment, we love animals, especially our own furry little critter. Grand Teton is full of dirt backroads that are off the beaten path. 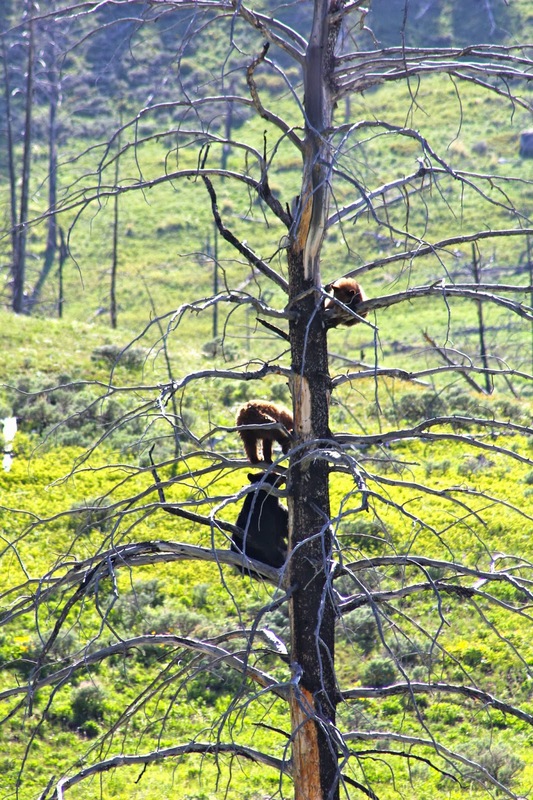 A few regulars told us those would give us the best opportunity to see animals, especially bears. We set off on one of the roads, and then we saw the surefire sign of wildlife: people. The rangers call them "paparazzi" because of their relentless pursuit of bears, wolves and moose. With their long-range lenses, I think they would have a promising career in New York or El Lay following Amanda Bynes for the next few years. Take care of yourself, girl. But the photographers were checking out a more mild-mannered specimen -- Blondie, one of the park's female grizzly bears. She was walking in the distance, only about 50 yards away (! ), when we pulled up. We watched her near our truck and were prepared to scramble in if she moved closer. She was casually meandering around, as she had been for about an hour, eating berries. Then Blondie simply turned around and walked back into her bear habitat, and out of our sights. Spencer and I couldn't believe our luck to see a grizzly bear on our first day in Grand Teton! Most of the paparazzi scattered and went in search of other animals, but we wanted to stay and wait. So we creeped along the road until it dead-ends into a hiking trail, waited, turned around and started to drive back. Just as we reached the beginning of the dirt road, we spotted her. It was Blondie, taking a nap in the woods, only about 20 yards away. It was just me, Spencer and the bear sunbathing about 20 yards away. The paparazzi and tourists were gone. Just me, Spencer and the bear. She must have realized she wasn't alone because she lifted up her head and looked right at us. Blondie was noticeably unimpressed as she let out a giant yawn and stretched out her tongue. Blondie covered her eyes trying to fall back asleep. It was too late. The paparazzi were back to check on her movements. Video surveillance, photographs, it's a good thing bears don't have cell phones because they probably would be wiretapped, too. There's a fine line of distinction between the paparazzi and the National Security Agency: The paparazzi are more forthright about their activities. With her peaceful afternoon slumber ruined, Blondie retreated back into the distance. I hope she found a quiet place to curl up and read a good book. I always enjoyed a good Berenstain Bears story, myself. 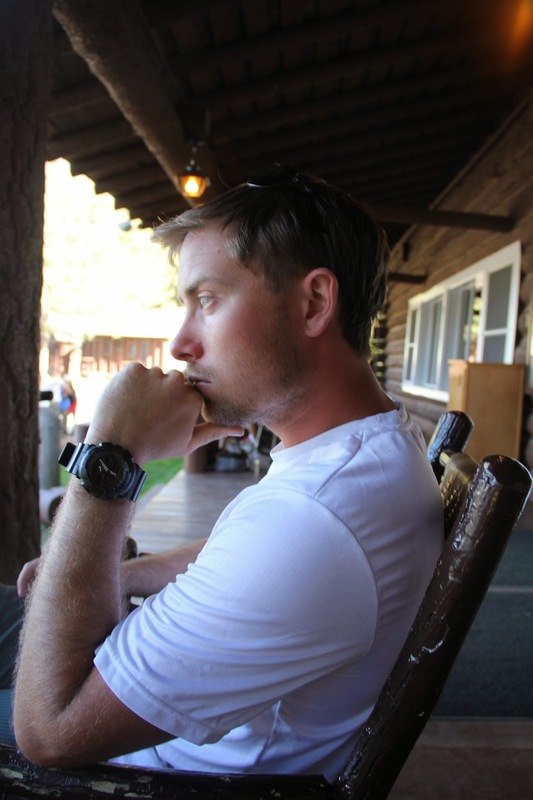 During our trip to Grand Teton, we witnessed so many other wild animals. Our friend the moose, was quite an exhibitionist and he seemed fond of bathing and drinking in his favorite watering hole. I nicknamed him "Norm" because he reminded me of that fellow from Cheers. Norm wasn't a complicated moose. He liked to wade, drink and occasionally blow bubbles underwater. His philosophy of life was a simple one: Don't worry. Be Happy. Spencer's motorcycle took us on several trails where we saw more wildlife and spectacular scenery from terrific vistas, including mountains that rise dramatically out of the ground with no warning of hills or high ground. We watched elk and deer frolic in the woods, perfectly content and unassuming. Spencer and I blended into the wilderness of Grand Teton National Park so well that one of its smaller inhabitants decided to make a home for himself in our truck tire. No need to worry, as he left promptly after some gentle prodding and urging. We already have one road pet, although I'm sure Ellie wouldn't mind a furry little brother or sister. One of the highlights of our travels was taking an evening boat tour along Jackson Lake. It was so fascinating to hear the legends and tall tales of early travelers and their experiences with this magical place. We saw deer that hide from predators on an island that is only accessible when the water freezes in the winter and is solid enough to walk across. The deer stay on the island all summer to avoid bears and wolves, although a few persistent ones will swim across the lake to reach the deer. Next to the snow-covered and jagged mountains, we even came across a rare sight. There was a bald eagle nesting at the top of some decaying trees. The boat trip certainly cemented our belief that Grand Teton is a special and unique national park, with wildlife that thrilled us immeasurably. This land is filled with gorgeous scenery, immovable mountains, deep lakes, and towering pines. Although certain aspects are so still they remind me of a landscape painting by artist Thomas Moran, this wonderful land is still very full of life. At every corner, in your peripheral vision, you see slight movement and hear the crackling of leaves and grass. Wildlife is everywhere. Our time here was too short, as that always seems to be the case in these national playgrounds. But the vibrancy and liveliness we felt here at Grand Teton will stay with us for the rest of our RV journey and even beyond. Blog design by Ready to Blog. Powered by Blogger.